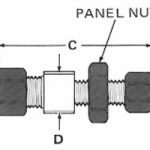 We here at Natural Steels are pleased to offer one of the premier lines of Bulkhead Reducer Tube Fittings that are designed for high-pressure applications in a corrosive environment. We can provide customized Bulkhead Reducer tube fitting in a different range of sizes, wall thickness and specifications at most competitive prices. Bulkhead Reducer is available in brass, copper nickel, stainless steel and several other metals according to our client’s requirement. It is the ideal component in tubing or piping that reduces the pipe size from a larger to a smaller bore (inner diameter). Our top quality Bulkhead Reducer Compression Fittings used for several applications in chemical, petrochemical, food, pharmaceutical, and many other industries. 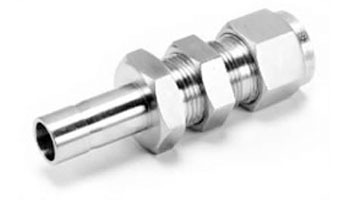 Also, these ferrule fittings are designed and manufactured with respect to various standards such as ANSI, BS, DIN and IS etc. For custom sizes, please contact a sales representative today. We stock a variety of sizes of Bulkhead Reducer and usually ships the same day. Natural Steels is one of the top manufacturers and suppliers of Tube Fittings from India. Our prices for Bulkhead Reducer are very reasonable. Please click on contact us now button or click here to send your requirement. Natural Steels maintains a high-inventory of Tube Fittings and can export them at the best price for Bulkhead Reducer. Natural Steels is a leading manufacturer, supplier and exporter of Bulkhead Reducer from India. We maintain a huge inventory of Tube Fittings and you can buy Bulkhead Reducer at the best price. Please click on Contact us now button or click here to send us your complete requirement to Buy Bulkhead Reducer from Natural Steels. Exporting Bulkhead Reducer to Singapore, Malaysia, Hongkong, Thailand, Indonesia, Taiwan. Other countries includes Afghanistan, Albania, Andorra, Austria, Bahrain, Bangladesh, Bhutan, Brunei, Belarus, Belgium, Bulgaria, Cambodia, China, Cyprus, Croatia, Czech Republic, Denmark, Estonia, Egypt, Finland, France, Germany, Greece, Georgia, Hungary, Iceland, Ireland, Italy, Iran, Iraq, Israel, Japan, Jordan, Kazakhstan, Kuwait, Kyrgyzstan, Lebanon, Latvia, Latin America, Liechtenstein, Lithuania, Luxembourg, Malta, Moldova, Monaco, Maldives, Mongolia, Myanmar (Burma), Nepal, North Korea, Netherlands, Norway, Oman, Poland, Portugal, Pakistan, Palestine, Philippines, Qatar, Russia, Romania, Russia, San Marino, Serbia and Montenegro, Slovakia, Slovenia, Spain, Sweden, Switzerland, Saudi Arabia, South Korea, South Africa, Sri Lanka, Syria, Tanzania, Tajikistan, Thailand, Turkey, Turkmenistan, Ukraine, United Kingdom, United Arab Emirates (UAE), Uzbekistan, Vietnam, Yemen.